Erik Hamren has been at the helm of the Sweden team since 2009 and this summer will lead the Scandiavian nation to the European Championship finals for the second time as a coach. The 58-year-old, who made Zlatan Ibrahimovic Sweden captain and has proceeded to get the best out of the striker on the international stage, will bow out of his role following Euro 2016. Inside Futbol's Samindra Kunti went to speak to Hamren, exploring his approach to managing Sweden, his plans for Euro 2016, his assessment of the country's next generation, his views on Ibrahimovic and much more. Inside Futbol (IF): You held a training camp in Abu Dhabi in January with a squad based on purely Scandinavian-based players. Were you satisfied with the camp and what were your observations? Erik Hamren (EH): Sweden had held that camp for a long time, even before my time as a head coach. I have been satisfied, because I can see a lot of young players, who may not be playing in our first team but who may get there in a few years – it was mainly the U21 and other young players. We learn about them and they learn how we work at the senior team. When they arrive at the senior team – a few have in the last couple of years – they know the coach and the staff. That’s a good thing. IF: You are in the final phase of preparation for Euro 2016, but how do you reflect on the qualifying campaign? EH: We had ups and down in the qualification campaign. Sweden went to the playoffs. It was about details – we had a fantastic scoring opportunity against Russia in the last minute – if we had scored, we would have qualified directly. Details decide success or failure. We played two good games against Denmark in the playoffs. They were the favourites with a better ranking. Sweden had not won against Denmark in over a decade. In the qualifiers we mixed good and bad games. IF: The game against Austria (a 4-1 defeat) was a bad one – was it a deja vu from the game against Holland? EH: If you meet a good team like Austria and make mistakes you will be punished. We learnt that against Holland. We started the game well, but we committed a mistake on an Austrian throw-in. [They got] a penalty, 1-0. Then we made another bad mistake, 2-0. We needed to score and opened up. They simply punished us and they were better than us, a bad result. Not everything was bad, it’s not black and white. As a coach I have to consider what we did well and what we did badly. We did a lot of positive things in that game, as we also learn from games we win. We recovered against Lichtenstein and Moldova, two games we needed to win. We were focused and concentrated going into the playoffs. That’s one of the reasons we performed well against Denmark. IF: Can you elaborate on those positives against Austria? EH: The start of the game was good – we showed we wanted to win the game. We prevented them from creating scoring chances. The first two goals were their first two attacks. We showed a good attitude when we made mistakes. It was difficult and we didn’t give up. You learn as a team and as individual players. IF: You went with focus into the playoffs but is it fair to say that Zlatan Ibrahimovic largely won you qualification? EH: No. That’s not fair. Zlatan is our big player. He scored three times in the playoffs. You have those players in many teams – Cristiano Ronaldo scores a lot of goals for Real Madrid and Portugal, Lionel Messi for Barcelona. Those world class players were really important. The good team unit was the reason we won against Denmark, with the world class player, who can sometimes help, but he can’t do it by himself. IF: You once said ‘A motivated Zlatan is worth his weight in gold for Sweden.’ What’s the secret to bringing the best out of him? EH: I made a good decision in making him captain, because he needs to take a lot of responsibility for the team as captain, and he’s been really good at it. I am impressed at the way he’s been taking responsibility. That had made him better too as an individual player – he gives a lot to the team and vice versa. It’s a challenge – a world class player and good players, but not as good as as him – to get a good team. We have found a good chemistry between the world class player and the team and vice versa. IF: How does that big responsibility translate? EH: It’s the way Zlatan acts on the field, during training, because if he shows what quality is, what it is to be 100 per cent, other players need to do it as well. If Zlatan is 100 per cent, I also need to be 100 per cent. Many of the young players had Zlatan as an idol and now they are playing together with him. It’s very important how he handles those players, how he talks to them, how he coaches them as well. He is good at sitting with the young players and talking to them how to be successful and how to work and live to be a good player. IF: Still, that balance between Zlatan and the rest of the group is delicate? EH: I don’t think so. Zlatan has taken a big responsibility and the team have an understanding of how to make him good. They are used to the media and fan interest in Zlatan – what he is doing and not doing. I haven’t seen any problems, but that’s a credit to Zlatan and the group. You need to be a unit. We have done that really well so far. Zlatan has developed as a leader, but also as a player. The responsibility and demands on him as a captain have been good for Zlatan as an individual player. He’s always been fantastic, but now he is matching his club level in the past with Sweden. He is scoring a lot of goals, etc. His biggest development has been his leadership because he wasn’t a captain before. IF: Does he also adjust his game on the field as his gets older? You have played him in different positions. EH: He is a clever man, he is older and wiser. Outstanding players can play in many different ways depending on their team-mates and the systems they play in. Zlatan has shown that at both Sweden and at club level. He is a very intelligent player. IF: Can PSG and Zlatan win the Champions League? EH: I hope Zlatan gets the chance to get to the final and win it. PSG have a strong team and they have been close in the last two years. IF: What are your intentions for the two friendlies in March? EH: I am going to mix – the set team and experiments. It’s my last chance to test a little. I am going to test a few players, then we have two friendly games before Euro 2016 starts – those will be more about playing the team, fine-tuning and gelling. We will do that in March too, but I am also going to test some players. IF: Would you consider Victor Lindelof of Benfica? EH: I believe in him a lot. I watched him in the Czech Republic at the Euro U21s and he was one of the players I was most impressed by during the tournament. He is still good with the U21. I hoped he would play more in the first team at Benfica. He’s done that, three games in a row. He was excellent versus Zenit. Yes, he has got a chance. He needs to play [at his club], so far he hasn’t played a lot. He is taking his chance and I hope he plays a lot during the spring. If he does that, then it’s going to be interesting for me. He can also play right-back. He’s a player I believe strongly in. IF: Oscar Wendt is playing very well in the Bundesliga as a left-back. You have selected him only a few times. Is he in your plans for Euro 2016? EH: At left-back Sweden have strong competition. We have four good left-backs. I have chosen two other ones instead of him. He is in our thoughts and among the competition, but the selected players are in front of him [in the pecking order]. IF: If Albin Ekdal is fit, can he play a big role? EH: Of course, he is a young and experienced player. He is a player who is going to get better and better. I wasn’t happy when he got injured before the playoffs, but we solved that. If he plays again soon, I can use him in March and in the Euros because he has been good at senior level. He played a few years in Italy when he didn’t play for Sweden because there were some better players in his position. When he got selected, he grabbed his chance. IF: John Guidetti starred at the Euro U21, is he a real candidate up front? EH: After his injury, Lichtenstein and Moldova were his first games. He played the last quarter against Denmark, but not in the second leg. He didn’t play so much for his club. It’s very important to play, in particular for young players, at your club; otherwise your progression stops. He has started playing and scoring. He is an interesting player, both as a football talent and a personality. Many players of the summer’s U21s can become really good and he is one of them. EH: It was a surprise that we won. At that level Sweden have not won anything. We had a good team, but to win – that was an excellent performance and showed a lot of quality. Some of the other teams had more individual quality, but we were strong as a team. As a small country, you need to do that. Belgium, for example, have a lot of players at big clubs in big leagues – players who dominate. Sweden only have one player and a lot of good players, but who don’t dominate and don’t play in big leagues. We need another strategy as a small country, it’s the same for the U21s. That’s what we can be good at. As a small football country this is our fifth Euro in row, that’s a statement for Sweden. IF: How can you translate that U21 success to the senior side? EH: We work closely with the U21 team, quite a number of them had already played in the senior team and during the January camps. We try to work together and have a good chance to be successful against other countries. IF: In Belgium 16 years ago there was a revolution at grassroots level – 4-3-3 and individual development – does Sweden also have a top-down vision? EH: Not in terms of the playing system – we have to play 4-3-3, 4-4-2 – not in that perspective, but the way we want to play – how do we want to defend and attack. The results of the youth Swedish teams are good, the last years have been the best years ever, and we have a vision on how to do it. I don’t know the Belgium system that well, but we can’t demand of the clubs to play this or that way – clubs have their own philosophy how they want to play and work. At the Swedish FA we strive for a unified way of work and vision, but some teams play 4-4-2, 4-3-3. It’s not about the system, but how to play. IF: What are the three fundamental characteristics of the Swedish national team and youth teams? EH: You could say four defenders, zonal marking – that’s common for all the youth teams and up the the first team. In attack, as a small country you have a kind of player and you adapt your way of play. You have Zlatan and you want to make him as good as possible. When he retires, we might have another strong forward with another skill set. You need to take into account the individual things, but we are working hard on the counter attack and the way we want to build up play. We have been better with technique, the skills, the ball, but perhaps we have lost defensive strength. In Brazil you have a lot of players they can use, between a lot of world class players, and they have more than one. We have a smaller pool. There might be a few years that we don’t have that class of players and then a new generation. It’s not so easy for us. In Belgium you have a really good generation with really good players. IF: What is your assessment of the Euro 2016 draw, meeting Ireland, Italy and Belgium? EH: It’s a tough group. It’s exciting and motivating. You look forward to this group and the matches, but if you are realistic – Belgium number one in the world, Italy 15th and Ireland 30th, we are 35th – we don’t have a chance. If you are realistic, we won’t progress out of the group. But why do you need to be a realist all the time? Then I would not be the national coach, we wouldn’t be at Euro 2016# because in the playoffs Denmark had a better ranking and we hadn’t won for over ten years against them. We won. There is a possibility [to progress]. If the players think this way and we maintain a high level during the tournament, we have a chance. That’s our goal in the summer. Belgium are the big favourites, but they will face big pressure – the whole country expects them to go to the final. That will be huge pressure. Italy join Belgium as favourites to progress. Sweden and Ireland are the underdogs. 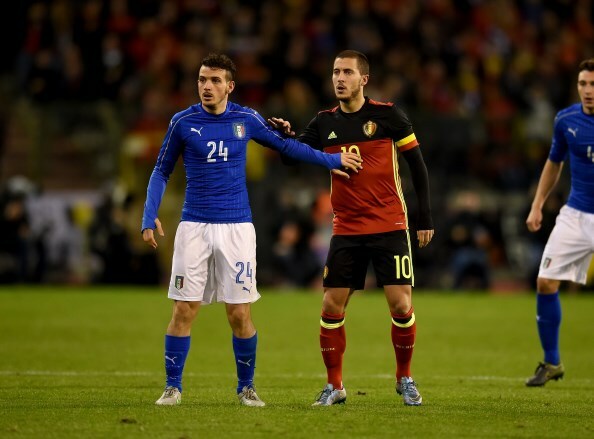 IF: So you deem Belgium favourites, not Italy? EH: Yes, of course. Italy have the history, but you have to look at today. Belgium are ranked number one in the world and there is a reason for it. Belgium’s players and results [speak for themselves]. They have so many good players – [Kevin] De Bruyne, [Eden] Hazard, [Vincent] Kompany – at big clubs in big leagues, many more than Italy. They are number 15. For me, Belgium are the standout favourite in the group. IF: You played Belgium in Solna right before the 2014 World Cup. What are your memories of that game? EH: That Belgium were good. It was one of their last games before the World Cup and some of the players were already at the World Cup in their minds. Belgium are better today and they will be much tougher opponents, but we have become better as well. Sweden were not at their peak at that time either. Zlatan wasn’t playing. Belgium play the kind of football I like and have a lot of individual players who can win the game – that’s important if you want to go far in the tournament. IF: What are the strengths and weaknesses of the Belgian team based on that game and videos you have seen? EH: I don’t talk about their weaknesses (laughs). We are going to be quiet about that because we want to exploit their weaknesses! All teams have weaknesses. Belgium’s strong parts are their strong players, who can challenge and win duels – Kompany, [Axel] Witsel. One of their strengths isthat they have depth in their squad – injuries or out-of-form players can be replaced with equal players. You see the results in their games. We also see weaknesses, but the challenge is to use them, not only see them. We have to manage to deal with them on the pitch. IF: How can you handle both Kevin De Bruyne and Eden Hazard? EH: They can show flashes of genius at any moment. We need to be strong as a unit, as a team. If you compare Sweden’s players with the Belgian players, one by one, they are stronger. We need to be better as team. We need to be efficient when we create chances to score. Belgium will dominate the game, that’s the expectation. They will have ball possession. We need strength in defense and efficiency in attack. Belgium need to have a not so good day, but we can do it. IF: Are you surprised by how strong Belgium have become? EH: I am really impressed. Belgium is not a big country either. They have really changed and evolved. I don’t know exactly how they have done it, but I am impressed. They are number one in the world and you can’t get better. [Coach Marc] Wilmots is getting the maximum out of his players, but there will be pressure on him and the players this tournament. It’s now, and at the next World Cup, that this generation should win. At the moment Wilmots is doing really well. The coach is always responsible for the team and the results, so all credit to him. IF: Belgium might be favourites, but the key game for Sweden is the opening match against Ireland? EH: I agree. We are ranked similarly. The team who wins the game between Ireland and us has a good chance of progressing. Whoever loses will have a much, much tougher route to progress. It’s three games, everything can happen. We can draw, but the winner of Ireland-Sweden has a good chance to go further because the number three can qualify. IF: Do you expect a different Ireland team from your two previous encounters? EH: From what I have seen so far, they are stronger, a better unit. We drew with them in Stockholm and won in Ireland, but both games were tight and contested. It’s going to be the same case again, but I agree that it is a key game. IF: This is your second European Championship, how will you plan and approach it differently from Euro 2012? EH: I got experience and a lot of the players have experience. They might not have had it before. You need experience. For Belgium, for example, it might be a question of experience. They played in the World Cup but before that there was a long gap. Italy have history and that’s why they are a tough team, they have played all tournaments. That is important. We can take our experience, the bad and the good, to this tournament, and change. I won’t say what we will change. We were learning at Euro 2012. IF: What’s your general formation? EH: In the qualifiers we have been changing between 4-5-1 and 4-4-2. The last few games we have been playing 4-4-2, but it is good that we can change. The ground system is going to be 4-4-2, but we can play 4-1-4-1, 4-5-1, but it depends on who is playing for us and how our opponents are playing. IF: You have always stressed team unity – morning breakfasts and ‘the interconnectedness of things, physically and mentally’ – a key feature in this tournament? EH: I believe so. Small details make big things happen. If you are disciplined and do your best to affect all the details you can, that’s important. You need to feel that you have done your best, then you are a winner, even if you lose the game. If you do what you can and what the team can do, you have the chance to be a winner too. IF: At the highest level it’s about the details, but can a breakfast together really change something? EH: In my opinion, yes. Many of those things can help you to be better at team work. Football is team work. Sweden do not have many individual players at the top level and so you need to be better at something else – the team work and team spirit. Breakfast can help you to get better in those things. IF: What should Sweden’s aim be at Euro 2016? When will you be personally satisfied? EH: To progress from the group. Once you get out of the group, anything can happen, it’s knockout and anything can happen in one game. Of course, we want to go as far as possible. The first objective is to get out of the group. I’ll be satisfied if we have done our best and if our performance in the games was really good and at a high level – when we show team spirit and the right attitude. 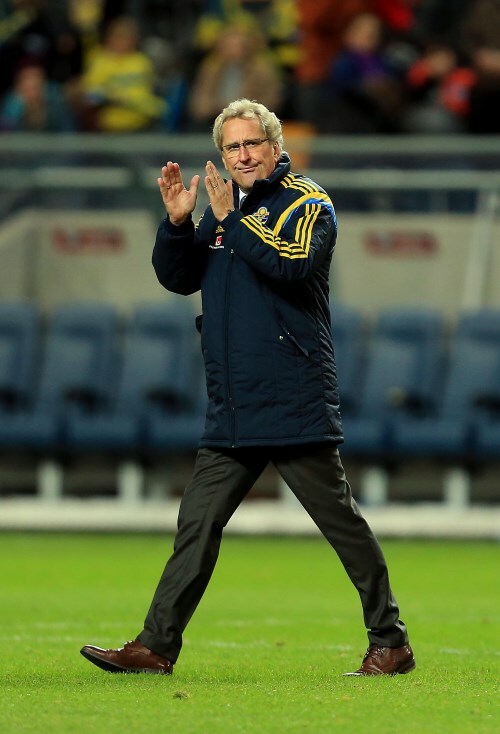 IF: This will be your last tournament as head coach of the Swedish national team. What do you want your legacy to be? IF: Well, when you were appointed, you said you wanted to play more expansive and dynamic football. Do you feel you have delivered on this promise? EH: Sometimes I have delivered. We have a goal to do that, but you have to remember your circumstances and the players you have. The results are important in this job. You have to use [your knowledge of] how to get the results. I have sometimes been satisfied with our way of play, sometimes not so much, but we are still working on it, it’s not in its final stage. You work on it all the time. I have the experience to understand that we are not a top team playing at the top the whole time, so our performances go up and down. You try to be stable at a high level. In three qualifiers, we have managed to reach the finals twice and in the third we went to the playoffs after Germany and lost against Portugal. We have done quite well. For me to finish, I hope we have a good performance at Euro 2016. IF: Can you highlight a few matches when you were pleased with your playing style? EH: I have had that question a lot after announcing I would stop after Euro 2016. I have some fantastic games in my mind; the second half in Berlin when we were 4-0 down and we drew 4-4. That was a half when we excelled in my opinion. The first game in the playoffs against Denmark was really good. One more – the last European qualifier against Holland. They were number two in the world at that time. They had only lost one game in five years, and that was the World Cup final against Spain. We won that game. Zlatan was suspended. I hope the best ones are coming this summer. IF: Can Belgium win the tournament? EH: Yes. They are the number one. You have to respect the team for that. Every country – Germany and Spain – respect them. The problems I see are their lack of tournament experience and the pressure from the fans and the country. This generation has to do it now. They will feel that, but if you see the quality of the players and their results, yes, they can win. 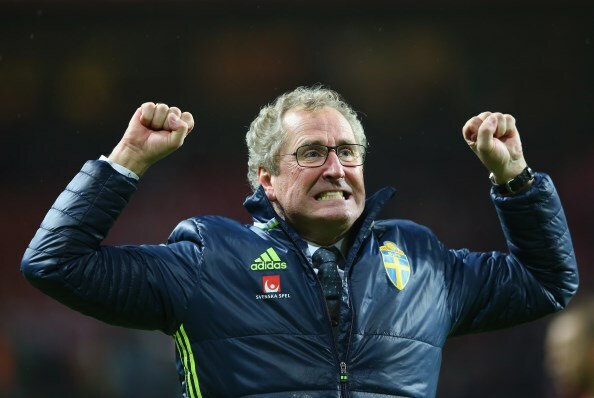 IF: Final question – how should Sweden prepare for the post-Hamren and post-Zlatan era? EH: I am not thinking about that! Other people will work on that. I look forward to Euro 2016, my last games with the national team. It’s been a fantastic time. My entire focus is to get the best performance and result possible.